Icame from a long line of bitter women. And ever since my mother died of cancer when I was only nine, “Why, God?” had been the backbone of my prayers. Though I knew Christ, my life was characterized by worry, bitterness, anger, resentment, and discontent. 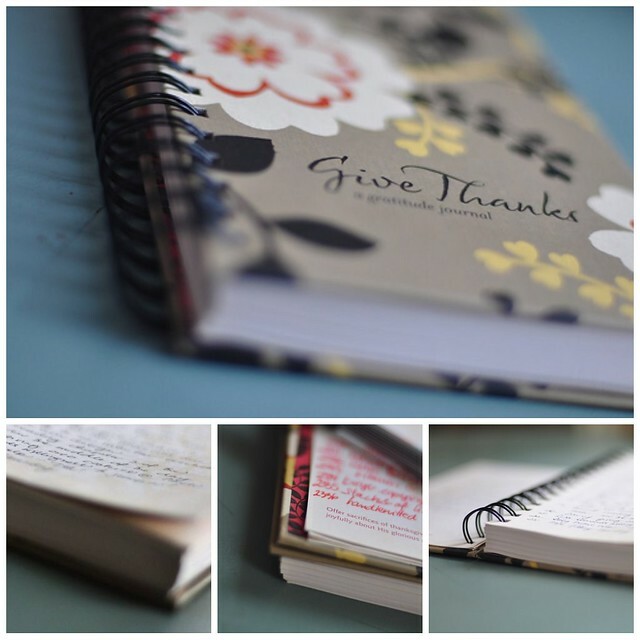 I found the Gratitude Community in June and within a week I began my own gratitude journal. The Holy Spirit nudged me to begin literally counting my blessings. And this simple practice of daily recording has radically changed my perspective. In the months since that day, I have daily battled Satan and the ugliness of sin within. I have dealt with piles of dirty dishes and dirtier laundry. I have watched people I love make terrible choices and had relationships implode. And I lost a dear friend and mentor to cancer on Christmas Day. I have recorded two thousand of His gifts. And doing so has changed my life. “The grief is intense. I’m overwhelmed. I don’t know what to do. But here is what I am not doing: I am not giving in to bitterness. I am not letting fear take hold. I am not doubting God’s love for me. How very glad and thankful I am that I began my thousand gifts list when I did! For now…with nearly two thousand gifts before me on the page…how can I ever say that He is not good? How can I possible give in to despair or lose my joy in Him? And the book, One Thousand Gifts — I have never read anything (except His Word) that brought me so clearly face-to-face with who I truly am…and who He is. It drove me to tears. To prayer. It drove me to action. It is God Who has wrought this change in me, I know. But He used this community of thanks to do it. “Thank you” has all but replaced the “why?”—-So true! Maribeth ~ Your testimony to God’s molding and shaping is a gift to me! Thank you! Maribeth–He fills us with Himself and it pushes out everything else. Thank you so much for sharing your testimony. Your words give Him Glory. You words overflow with Hope. Your story, like Ann’s, will encourage others to start the journey to change the lens through which they see the world. Ann–I cannot begin to tell you “thank you” enough! Your words, through your blog and your book, are such a blessing to me. And I have shared your book with many (in fact, Amazon only lets us order 3 at a time and then we have to wait!!) But I give them away as fast as I get them. And you should hear the hearts! They tell me what we all tell you: it’s changing everything!! Thank you, dear sister. We love you and we thank God for you. Anne, me, too! I just ordered 3 more copies from Amazon earlier today….and I already know where 2 of them are going. Don’t you just love to see how God directs us to those hearts that need Him? Bitterness. Ugh. I never thought I would be one to harbor such an ugly thing. It has become my companion over the past two years. I have listened to sermon after sermon, podcast after podcast telling me to put away all bitterness. “That’s what I want,” I’d say. “But how do you do it?” I’ve listened and prayed and searched for the ‘How-to’ manual on getting rid of bitterness. Slowly, gratitude, thankfulness, joy are refilling my heart leaving bitterness behind. That is the answer, that is the how-to. It doesn’t come all at once, but it does come. This morning I vowed that I would live for the moment, not in sadness over the past or fear of the future. I would live the right now moment. My right now is beautiful and I’ve been missing it looking behind and peering ahead. Not any more. Thank you for your message. Bless you in your journey to be thankful, even in the hard things. I too come from a long line of bitter women, and from a childhood of horrid abuse and neglect, and had the roots of bitterness within my own heart as a young woman. I am so thankful, daily, moment by moment of the journey of forgiveness and choosing JOY the my HEAVENLY FATHER walked, and is walking, me through! Thank you for sharing your story Maribeth. And ANN, thank you for sharing yours daily and through your book. You are part of the landmarks and standing stones the LORD is walking me through on this journey of laying down bitterness and embracing joy, grace, mercy, gratitude. I don’t know how or if I even want to. It seems so simple and yet this ugliness has been my “friend” for so long. I wish I could truly know that He loves me and then I could possibly love myself and stop being so insecure, angry, bitter, etc. Thank you for hanging out with us as over the next few weeks, I promise to write in my quiet corner about these things, and we’ll keep wrestling together…. Like Jacob, a struggler, we won’t let go of Him until we know His blessings and love. That is body life at its best, Ann. How else can the weak be made strong, but to have someone come along side until the weak one gains enough strength to go at it alone, with her God. Yes. Some are that weak. I am… that weak. Looking forward to Friday, Ann. Thank you. I hear you, sister. Yes — the ugliness as a friend. I know. And just writing down one grace every hour, looking for one, just one way, that He was loving me right now — even the smallest way… this is the smallest, slightest of beginnings… and then one more. And for me, getting to a thousand ways He loved me… began to make my heart realize what my head knew. But that’s just my humble, small journey… maybe there’s something there for yours, Cari? Thank you my sister-in-Him. I will not give up, I will persevere because I so don’t want to continue to be this person. I don’t want my children to remember a mommy full of rage and gritting teeth. I see the sands of time ebbing away so quickly carrying away the infant and childhoods of my entrusted gifts and I don’t want anymore regrets! This was sooo good for me! I think I found a kindred spirit! The first two lines startled me… My name is also Maribeth and my mom died of breast cancer when I was nine years old. The choice is always before us to give thanks, to choose gratitude rather than bitterness. To know that GOD is so Good and HE does all things well. HE knows what will draw us to HIM! So much love for you sister.. This title of the post drew me in. I, too have had to deal with bitterness. I love how gratitude is the answer to the bitterness. It helps us to overcome that awful darkness that buries itself deep down inside. Oh my…giving thanks for this post right now. Thank you. I too come from a long line of bitter women…and God, long ago, as I grieved the loss of our twin daughters and newborn son, on my face in my room…whispered to my heart that gratitude was the key to unlocking bitterness. He set me free that day and everyday since. I too lost my mother to cancer four years ago…and this week, lost my dear friend…my mentor…my second mom…to cancer in all it’s ugly….I’m trying, but cannot write ugly-beautiful next to the cancer. Not yet. Even though, I can’t write it, I know it’s there. I have watched it next to the bed with waning breaths breathing as this life slips into the next. I have watched it more than once. And, I ache. But, in the aching I know He is there. In the aching, I cling to Him. In the aching, I remember all that He has already carried us through…and I know He carries us still…even when all I feel is the ache. Thank you…thank you for speaking what my heart already knows…for confirming truth. For reminding me of His beauty in all the ugly. Maribeth, this was so, so good. “I am not giving in to bitterness. I am not letting fear take hold.” I needed to read those very words today. Thank you for sharing. You have blessed me. I never thought of myself as bitter. Parental love was always conditional and childhood never happy. And their was church abuse. I always knew God was in my life, but I can see that my heart was not ‘soft’ and truly trusting. I was a worrier. Now that my own children are grown and scattered around the country, and my husband is with the Lord, I am alone. Finding the gifts has started slowly for me, but I do not want the end of my life becoming a bitter example. I want to glorify God by trusting His goodness even in this dark and lonely place. Thank you, Ann, for this book. It is just what I needed – to see grace!